At the Chambers & Chambers trade tasting this week, I had a chance to visit and revisit many wines from all over Italy. Gourmet thin-crust pizzas from Lulu restaurant in the SOMA district of San Francisco complemented what seemed like 80-100 wines. About half the wines at the tasting were imported through Dalla Terra, founded by Brian Larky, a very funny dude. But funny is obviously not all he is - because Dalla Terra is a clever concept. They essentially eliminate one of the tiers in a 4-tier wine import distribution system, through their Winery Direct program. Due to laws established at the end of Prohibition mainly to allow the government to capture more taxes, wine distribution and sales in the United States require wine producers to sell to state distributors / wholesalers who then sell to retailers or restaurateurs before a wine becomes available to consumer. Different states have legislated different quirks - for instance, some allow internet sales and shipping from out-of-state direct to consumers, and some don't. Some allow selling wines in supermarkets and some don't. And so forth. So let's see if we can keep it straight. The wine producer / winery is tier 1. The wholesaler / distributor is tier 2. The retailer and restaurateur are tier 3. Finally the consumer. In the case of imported wine, there is also an importer who sits in between the producer and the wholesaler / distributor, thus the importer is tier 2, while distributor / wholesaler and retailer / restaurateur are tiers 3 and 4. Debates have been going on forever as to the requirements and value-adds of each tier. Some companies actually manage to play the role of multiple tiers. For instance, an importer and distributor as one. The famous wine merchant Kermit Lynch imports, distributes, and sells in his own shop in Berkeley. He also sells wholesale to tier 4. He even owns a winery in France which he then takes to the US market, thus effectively combining all 4 tiers into 1. And then there are national distributors vs. state distributors, so even more complications and hand-overs along the wine supply chain. You can imagine - the more hands a wine changes, the higher mark-up it would usually have by the time it reaches consumer. Take a look at the illustration of how Dalla Terra claim to bridge some of the gap too on their website here and here. Also, a good article on the wine disitribution tier system is here. In California, Dalla Terra brings wines through the very reputable Chambers & Chambers Wine Merchants, who themselves are both importer and distributor. The 4-tier wine import & distribution system is complicated and convoluted. Rules are different in different states, and some states like Utah and Pennsylvania have severe restrictions on how wine is sold. In most places, clever and knowledgeable business people like Brian Larky still manage to figure out ways to bring terrific wine to this country at acceptable prices, and for that we thank them! Delicious thin-crust pizzas at Lulu. Here are the wines I particularly enjoyed at the tasting. Casanova di Neri Brunello di Montalcino 2004. This was their basic "white label" Brunello. (The 2001 Casanova di Neri Brunello made a splash with their higher-end "Tenuto Nuova" cuvee by being Wine Spectator's #1 wine of the year in 2006.) Had this basic Brunello at the tasting and, more importantly, at a dinner next day. The wine is from the excellent 2004 vintage and is showing very well - juicy fruit, good acidity, tasty tannins. Exploding with aromas and fruit flavors, the wine is light enough to even go with fish (I had it with Donato's pan-fried branzino), thanks to the excellent acidity and medium body. Delicious. Marchesi di Gresy Barbaresco "Martinenga" 2006. Sweet, charming, red fruit, beautiful strawberry / cranberry color, gentle Nebbiolo texture, and the most accessible of any 2006 Barbarescos/Barolos I've tried so far. Vietti Barolo "Castiglione" 2006 - structured with slight menthol character, complex. It was the best wine match with the gourmet sausage pizza. The 2006's are starting to open up. The 2005 "Brunate" didn't have the menthol, but was also good. Dependable, top producer of Barolo, Vietti's Barolo Lazzarito 2005 impressed me at the 2010 Tre Bicchieri tasting earlier this year. Their Barbera and Arneis are good too. Vietti Barbera d'Alba "Scarrone Vigna Vecchia" 2006. Wonderfully balanced, rich, plush Barbera that tips to the much-maligned modern style, yet the delicious factor is undeniable. The most expensive Barbera I've ever seen ($75-100 retail). Rare, from a tiny lot in the prime Nebbiolo-caliber vineyard in Castiglione. More of a curiousity item, in my opinion, since in that price range, the wine has to be hand-sold to affluent buyers, looking for something "different", and will be competing with high-end Barolos and Brunellos. For those who are willing to shell out big bucks for "something different", there are options in Taurasi (from Campania), Sagrantino di Montefalco (from Umbria), and Etna Rosso (from Sicily) that come to mind before Barbera. Good wine, tough sell. Roccolo Grassi Valpolicella Superiore "Roccolo Grassi" 2007. Single vineyard. Solid. Roccolo Grassi Amarone "Selezione Antonio Castagnedi" 2006. All three of the Roccolo Grassi wines (including a white, mentioned below) were excellent. A producer to pay attention to. The 16-17% alc. the Amarone didn't taste hot at all. Selvapiana Chianti Rufina Riserva "Bucerchiale" 2006 - from a great vintage in Tuscany, excellent structure and texture, medium body. The detractor was notable heat on the palate - and lo and behold, the wine was a whopping (for a Chianti) 14-15% alc. Cherchi Cannonau di Sardegna Rosso 2009 - good example of the native Cannonau grape of Sardinia. Very drinkable and food-friendly. Vignalta "Gemola" 2004 - "Super-tuscan" from Veneto! (blend of Merlot and Cab Franc) - flagship of the Vignalta portfolio, well-balanced fruit/veggie, right-bank-Bordeaux like. I just noticed - it's the second time I tasted this wine (first time at the Tre Bicchieri 2009). Liked it both times. Nice effort. Italian whites are a myriad of grape varietals and regions. Generally unoaked or low-oaked, crisp, food friendly, and quite interchangeable. I find Soave (from Veneto), Arneis (from Roero, Piedmont) and Ribolla Gialla (from Friuli) generally to my highest liking. But I enjoy many others depending on the particulars. Vietti Arneis 2009 - good. Roccolo Grassi Soave "La Broia" 2007. All three Roccol Grassi's wines (including two reds mentioned above) were good. Inama Soave Classico Superiore "Vigneti di Foscarino" 2007. More generous (but tasteful) oak treatment made this wine richer, more complex, more serious than a typical Soave, clearly showing the range of the Garganega grape of which Soave is made. Very good. Marco Felluga Collio Bianco "Molamatta" 2008. Blend of Pinot Bianco, and the native Tocai Friulano and Ribolla Gialla. A tasting like this reminds me how much I love Italian wine. And the photos of those pizzas next to the above-mentioned vino make me salivate. It's almost lunch time here. I'm hungry. How about you? Second year in a row, tomato frenzy goes into overdrive in an otherwise quiet corner of the Bay Area in Santa Clara, where the tomato goddess Ann-Charlotte (aka AC) throws the annual tomato taste-off extravaganza from the fruits grown by herself and by her fellow urban gardeners. When I think tomatoes, I tend to think Italian wine, and indeed, Italian wines provided a symbiotic backdrop to the unbridled glory of yesterday. This time of year, I like to prepare zucchini fresh out of my garden, as I find it goes well with tomatoes and light and tart Italian reds, like Produttori del Barbaresco Langhe Nebbiolo 2008 shown below. The giant striped heirloom zucchini from my garden went into this delicious Zucchini Gratin recipe from The Barefoot Contessa cookbook, which I jazzed up by a healthy helping of organic cayenne pepper. Crisp, chilled Italian whites are excellent to whet the appetite or as accompaniment to tomato snacking. (I admit I cheat a little by pre-tasting some tomatoes before the official proceedings commence.) Inexpensive wines from Sudtirol/Alto-Adige and Friuli, with their fantastic minerality and refreshing citrus flavors, such as this Moscato Giallo from Manincor (a totally dry Muscat wine, unlike the more common Moscato d'Asti, the sweet sparkling wine from Piedmonte) are totally under the radar of the average wine consumer, and that's a pity. Last year, AC taught me to appreciate tomatoes in a whole new way. She also supplied 20 different kinds of heirloom seedlings for my own garden this past Spring. Keeping all the varieties straight is no easy feat. But thanks to the taste-off, I can now put the tomato faces to the names, confirm my faves, and come next Spring, re-request my beloved varieties from the tomato goddess. It's been a cold growing season in Palo Alto (sounds funny "growing season in Palo Alto", where we have a new high-tech start-up on every corner). Finally by late August, most heirlooms started ripening, but there are still plenty of tomatoes slowly maturing on the vines. Other than requiring patience, I quite like the cooler whether, because the ripening is spread more evenly throughout the season, just a few heirloom babies every day from my twenty or so plants. In grape growing, a longer growing season is usually a very good thing, if it doesn't get ruined by early autumn rain - long hang-time allows the fruit the get extra complexity. Could it be the same for tomatoes? No matter what, we always find time to play with AC's gorgeous Persian kitties. AC takes her tomato competition very seriously. And her attitude infects the eager crowd. After all the chopping, tagging and plating is done, and the myriad of red, dark, striped, orange, yellow, green, and everywhere-in-between specimens are arranged on the long table, the feeding & judging "frenzy" ensues. 3. Momotaro. This innocuous looking Japanese tomato packs a flavorful karate punch. 4. Green Grape. This innocent looking baby explodes in your mouth with kaleidoscope of flavors. 5. Purple Jasper (my wife's fave, too mushy for me). 6. Purple Lipstick. This one is a classic, and can often be found at farmer's markets or supermarkets. 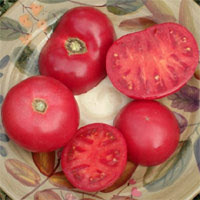 In retrospect, it seems that striped tomatoes tend to get more complex and balanced between tang and sweetness. Juicy, non-mushy texture is important. Not to mention the visual appeal of the stripes. In fairness, gotta give credit to some of the yellow and orange colored tomatoes too, like Phantom du Laos, Pineapple, Amana Orange, Dr. Wyche's and Olympic Fire - not as multi-dimensional as the above #1 through #6, they are nonetheless an amazing complement to salads where other ingredients fill in the missing flavors and textures. And even the tomatoes with shyer tastes come alive when sprinkled with a pinch of sea salt. Tomatoes are also delicious in jams, of all things! Last year AC, Rona, and several other friends canned a few different tomato-based jams. Shown here are Lemon Tomato Lemongrass jam and Tomato Shiso jam. With tomatoes, as with wine, I put high premium of acidity. Not so with many other folks who prefer sweeter sensation. 1. Momotaro, 12, 3. This Japanese baby came out of nowhere to steal the show. I'd never even heard of it, not to mention spelling it. 4. Black Chocolate 8,2. With a name like that, what's not to love! On another perfect Palo Alto Sunday, 75 degrees and blue skies, as I am finishing up this post, I am about to head over to my "end of summer" neighborhood party thrown each season by the vivaciously gracious Anne & Eric Harrison. Living in a classy corner of Palo Alto, I have to bring something classy (besides myself). What else but a panzanella salad from fresh cut heirlooms from my garden, along with a bottle of a cool Italian wine! Salute! Guys, wondering what to do to impress the ladies? Step 1. Grow your own heirloom tomatoes. Step 2. Invite the ladies. (can't help you here). Step 3. Make a bruschetta according to my friend Ash's method. Cut up tomatoes from step 1, add a little chopped garlic, basil, extra virgin olive oil, chilies, and salt. Let the mixture sit for a few minutes...then spoon on top of toasted (preferably on the charcoal grill) sliced rustic bread. Step 4. Serve with a wine that has enough sweetness (or ripeness) to counter the spice of the bruschetta, and enough tang to keep it lively. A 2009 Cotes du Rhone from Chateau St. Cosme that runs about $12, hits the spot. Bright, balanced, rich wine, it's a baby Chateauneuf-du-Pape without the sophistication and the price tag. This producer churns out excellent values out of Southern Rhone year in and year out, the just released 2009 vintage being no exception. I imagine many of the bolder Italian wines such as Montepulciano d'Abruzzo, Amarone, and Aglianico from ripe vintages would go just as well, but last Saturday night when I met the bruschetta, the vino whispered to me in French. Remember the rule of thumb - sweetness and spice go together. Throw in a bit of Italian or French. And you've got a killer recipe for the ladies! Dining and wining with Persian kitties. Paring padrons and Riesling. My friend A.C. is an urban gardening queen. In her back yard and in a rented plot in a community garden in Santa Clara she grows enough organic veggies to feed a small army. Once a year she throws her famous tomato taste-off. She is as passionate about tomatoes as I am about wine. And her second most favorite vegetable has got to be padron pepper, pan seared with a little olive oil and sea salt. Tangy, piquant and usually not hot, this delicacy is a favorite finger food amongst the Bay Area's discerning foodies. There is an occasional spice-bomb in the mix that hits you like a chunk of wasabi. In a situation like that, a chilled off-dry German Riesling (Kabinett level, like a Donnhoff Kreuznacher Krotenpfuhl from the solid 2008 vintage) is just what the doctor ordered - a highly recommended pairing. Even her two championship Persian kitties are enamored with the veggies - I guess it runs in the family. Followed by her signature sausage lasagna, loaded with home-made tomato sauce, with garden oregano and rosemary, and the tenderest ever sheets of melt-in-your-mouth pasta (I am begging for the recipe) with a bottle of Massolino Barolo (or any other tangy Italian red), life is good! Viva A.C.!